I was a little sore this morning, possibly because my last three runs were done at high effort (though perhaps not at high speed). I haven't put up any sub-9 runs yet, but I'm moving in that direction. My saving grace today was the need to have an early call to Asia. That allowed me an extra hour to loosen up my leg muscles before my run. Have you ever thought about how great everything seems after you've completed a fast run? You can point to it with pride and feel good about what you've accomplished. But as they say in Hollywood, you're only as good as your last movie. And when training for a race, you're only as good as the last time you ran. Time for resting on your laurels = 1 day. And that day ended for me this morning at 8:00 AM. I started to prepare for my run after completing my call. Wednesday's good experience had now become today's burden. I knew I couldn't default to my easy running pace and, while I wasn't planning to go all-out, I had mentally set my target. I was determined not to come up short. A slight soreness in my legs threw me off on the first half mile. I willed myself to run faster, but I'm not sure the effort fully translated. I do know that when I'm actively thinking about performance, my speed will usually move into the acceptable range. My goal today was to do better than that, so I kept up the mental pressure and hoped that would yield a good result. I was pleased to see that I ran 5 seconds per mile faster than yesterday. It was great to repeat a good performance and I feel I'm heading in the intended direction. I have the rest of the night to enjoy today's gains. Tomorrow morning, expectations return. I so agree about being only as good as your last race. Let us know when you get a sub 9. I'm no where near there yet. I'm not a graphic artist (I actually do media technology), but I do have some background. I've always found it useful to use imagery to explain complex ideas when I give business presentations. 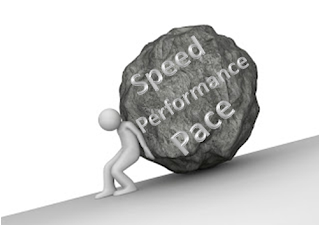 In terms of performance expectations, it's funny how much pressure we put on ourselves. You would be running in the 8:00 minute range if not for your injuries. When I get there, I will definitely be sharing it on ER!